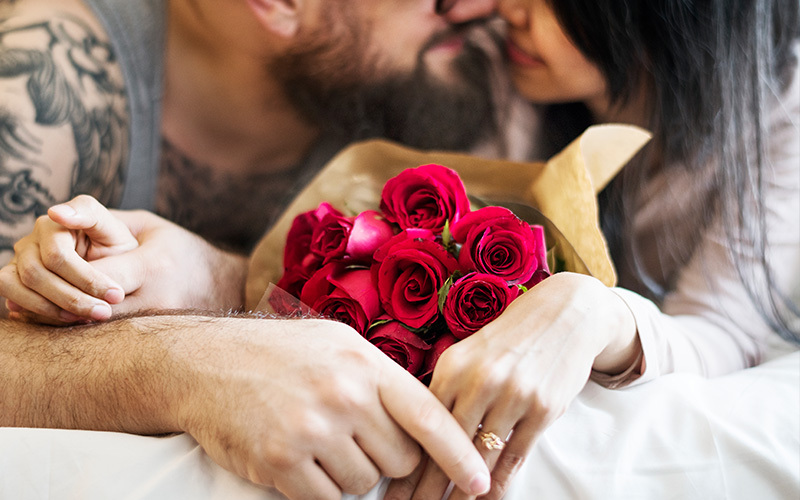 This Valentine’s Day the best gift for your loved is a gift of an aromatherapy massage and a customized aromatherapy blend with rose essential oil. Aromatherapy oils enhance the effects of the massage and send you into a state of bliss and total relaxation. Rose Oil has been used as a symbol of love and beauty for thousands of years. Rose petals were scattered at weddings to ensure happiness. Rose oil inspires emotional calm and stability and its aroma is powerful and comforting. Rose Oil and Rose Water have multiple Aromatherapy applications due to their well-known effects on calming the senses and balancing the emotions. Bulgarian “rose otto” is known as the finest rose oil or in the world. There is so little aromatic content in rose flowers that it a ton of petals produces only 10.5 ounces (300g) of rose oil so the oil is expensive. The rose is perhaps one of the most powerful symbols of love in the metaphysical world. It is also one of the most accessible tools that can be used for everyday magic. Valentine’s Day can be romantic as you visit the Spa and receive a couple’s massage of an aromatherapy blend with rose, frankincense, ylang ylang and lime essential oils. Aromatherapy is an ancient practice of using essential oils extracted from plants for both physiological and psychological treatment. People of early civilizations knew about the healing properties of plants. Today we have access to hundreds of these precious oils that can have a profound effect on the body, mind and spirit. Essential oils should almost never be applied directly to the skin and are best mixed in a carrier oil. Carrier oils are pure gentle oils, such as sweet almond oil, grapeseed oil or coconut oil. They facilitate the absorption of the essential oil blend into to the skin. Our special blend of rose oil, frankincense and sandalwood will be a symbol of your love for your special person. Give this blend together with a bunch of roses and a gift card for a Royal Coconut Milk and Honey Ritual treat. This Valentine’s day will be remembered for eternity. Be good to yourself and make this YOUR day! !